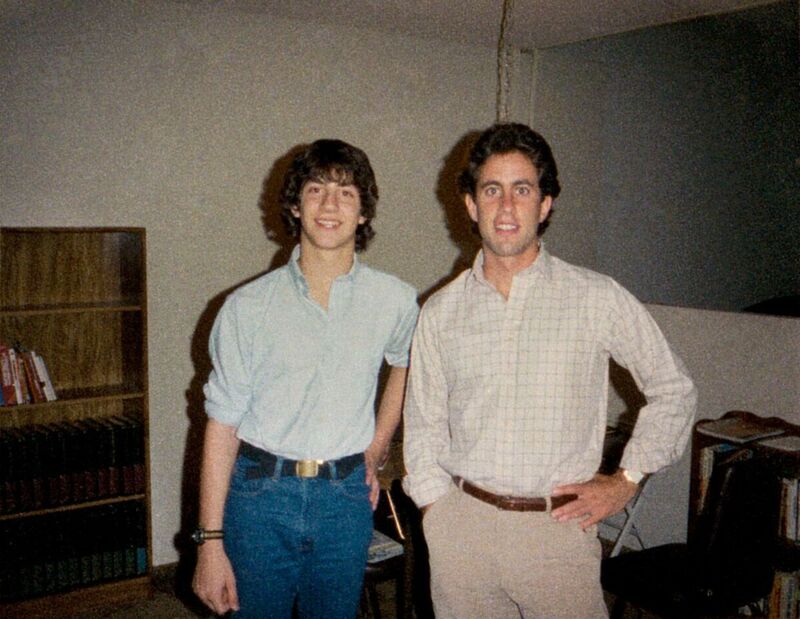 Its 1983, and an up-and-coming comedian named Jerry Seinfeld is scheduled to do an interview in his apartment with a journalist for a New York radio station. He opens the door to find pretty much the opposite of what he expectedor frankly, what anyone doing an interview would reasonably expect. Not a seasoned reporter, but literally a child: a 16 year old Judd Apatow, in fact. Slightly abusing his privileges as a 10th grader working at his high school radio station, Apatow had the idea to call publicists of his favorite comedians and simply ask if their client would be interested in being interviewed for WKWZ radio on Long Island. He neglected to inform them that, you know, it wasnt a real station and he wasnt a real journalist. But it worked! Apatow desperately wanted to be a real comedian. He had no idea where to start but figured that getting close to comedians would help. That way, he could learn. You can hear this in the questions he asked Jerry Seinfeld. One of them is literally How do you write a joke? That is not How do you but How do you write a joke? It was through these interviews that he received his crash course in a business that there really is no school for. In some cases, he formed relationships with people he would later work with after he became a writer, producer and director. He kept doing the interviews as he got older too, using it as an excuse to meet really important people who otherwise probably wouldnt have taken the time (eventually, he turned it into a bestselling book). I know a bit about this hustle myself. When I was in collegeand not a particularly good oneI did more or the less the same thing. I wrote opinion articles about people I wanted to meet and then I used the articleswhich I would post on my blog since the paper didnt have its own siteas an excuse to email them and get feedback. This is how I got my first internship with an author who would put me on the path to becoming a writer myself. I used it as a way to meet Dr. Drew, who Id grown up listening to, and ask him a question Id been dying to ask: What books should I read? He turned me onto the Stoics, which changed my life and eventually inspired a book of my own. Its common for young people to complain: I never get any opportunities. I just need one shot! Will somebody just help me? They see themselves as stuck in the middle of nowhere. They see themselves as cut off from the action because theyre not at a great school or their parents werent connected enough to help them get an internship. These are the same complaints that older people use. That they dont have a strong enough resume. Or they wish they had a mentor. Or an audience. Maybe youve heard yourself say something similar. The Civil Rights activist Booker T. Washington gave a famous speech in Atlanta in 1895 where he told a little story. A ship lost at sea for many days suddenly sighted a friendly vessel. From the mast of the unfortunate vessel was seen a signal: Water, water. We die of thirst. The answer from the friendly vessel at once came back: Cast down your bucket where you are. A second time, the signal, Water, send us water! went up from the distressed vessel. And was answered: Cast down your bucket where you are. A third and fourth signal for water was answered: Cast down your bucket where you are. The captain of the distressed vessel, at last heeding the injunction, cast down his bucket and it came up full of fresh, sparkling water from the mouth of the Amazon River. His message was that both white people and black people were ignoring the many opportunities that surrounded them. White business owners were so prejudiced that they were importing labor from overseas even though one third of the population in the South was black. Meanwhile, successful blacks were seeking their educations overseas or striving for high political offices when there were institutions right next door that desperately needed and wanted them. But put the racial context of that message aside, the line is one that any and every person ought to remember. Its something that we should be repeating to ourselves on a daily basis: Cast down your bucket where you are. That is, not where we want to be, not where we wish we were, not where we used to be but where are are, right now. Use what is around you, however meager, to make somethingto make an opportunity for yourself. Certainly, this is what Booker T. Washington did. In fact, this is how he got into college. Hearing about a nearby school in Virginia called the Hampton Institute, Washington traveled some 500 miles, often on foot, and sleeping under a raised sidewalk along the way to make it there. He showed up without a recommendation or even an appointment. He was 16 years old too. Sitting in a waiting room, he watched as students and faculty came in and out of their meetings. Eventually, he noticed a broom in the corner. He walked over, picked it up and began to sweep. He swept until the room was spotless, and then he kept sweeping until he had done the room three times. Then he found a cloth and dusted everything in the room multiple times. Finally, he approached the head teacher and reported what he had done. She inspected the room, discovered how immaculately clean it was, looked at him and said I guess you will do to enter this institution. In other words, he wasnt bullshitting when he said you can and should cast your bucket down where you are. Wherever you are. Even if its a waiting room. Even if youre 16 years old. Even if youre under-qualified or happen to live in Podunk, USA, just showed in Los Angeles without a single lead. Even if youre a founder who is looking to grow their startup or a successful musician trying to find their next bit of material. Theres something for you. Its right around you. Cast down and pick it up.